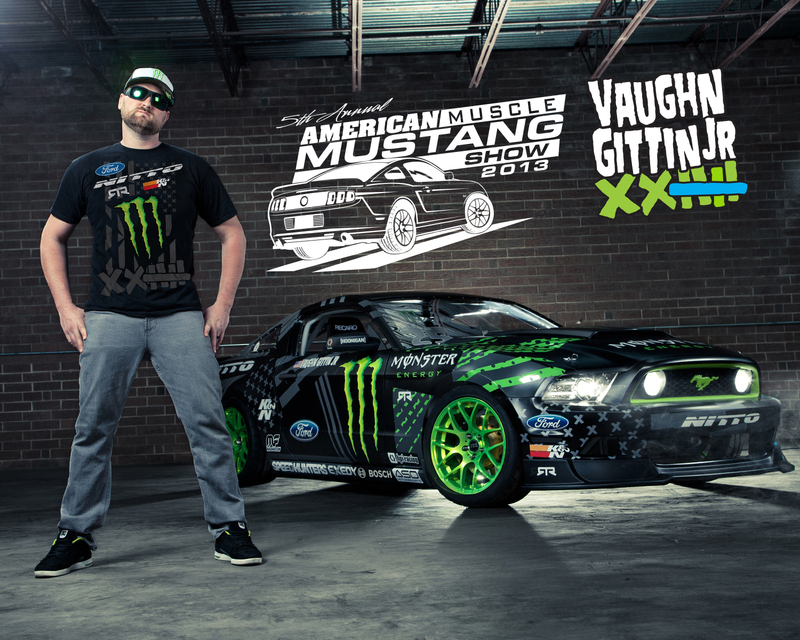 VIDEO: Vaughn Gittin Jr. at our Mustang Car Show This Weekend! If you haven’t seen Vaughn Gittin Jr.’s work, you’ll have to check out the video below. Vaughn Gittin is easily the most notorious drifter, sponsored by Ford Racing, Nitto Tires, Exedy Clutch, K&N Filters and Monster Energy Drink to name a few! With over a decade of experience in the drifting scene, he has taken home more 1st and 2nd place trophies in the last few years than most people see in a lifetime. Leading the Forumla D series year after year, Vaughn Gittin Jr. is the most iconic name when it comes to professional drifting. With years of experience under his belt, Vaughn launched his own aftermarket parts company RTR (Ready to Rock) Mustang Parts and sells aftermarket components as well as full RTR Mustangs that are, pun intended, ready to rock on the street! Previous Entry August 2013: 3500 HP, Chip Foose, 1400 Mustangs & a $300 Giveaway! Wow Jr. shows up and instantly we are now up to 1500 cars. You really want to be the largest show huh, well you kind of have the mustangs for that and once again still not as large as Mustang Week. It’s ok someone has to be second. There are two different counts–the amount of Mustangs actually entered in the show and being judged and the equally impressive count that includes “the second car show” that goes on in the spectator parking lot. The count that includes spectator parking exceeded the 1500 mark at last year’s show and will likely be larger this time around. Mustang Week compared to the AM Car Show is apples to oranges. Mustang Week is an awesome display over a 5 day period of time–there probably is around 1200 or more different Mustangs present over that period. The AM Car Show is the single biggest one day Mustang event anywhere and the largest Mustang car show, with the most Mustangs in one place at one time. It’s an incredible display of the enthusiast culture and one hell of a fun day if you’re a Ford fan. We hope you can make it out for this years show; I have a feeling you’ll be pleasantly surprised.